Dark in color with a lovely nose of black berries. On the mid pallet the wine displays rich black berries to match the nose. Some blueberry, not quite jammy but close. This is backed immediately by some firm tannins and some nice spicy/peppery notes along with noticeable alcohol. Careful not to breath in when this is first opened 🙂 The wine eases quickly with even some bottle breathing. I left it for about 1/2 hour and it helped. A little ageing would help as well. This is a very nice varietal Aussie Shiraz. It does not disappoint. I would give it an 89-90. Not bad for the price! We paired it with filet mignon (and even marinated the steak in it) and it went VERY well! 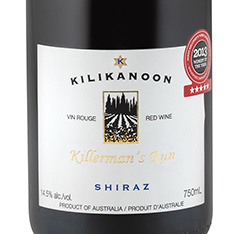 This full-tilt Shiraz is Kilikanoon’s idea of an entry-level wine. Some introduction! A hedonistic pleasure, it’s plush with blackberry jam, cherry and toasted oak. A bold match for barbecued spare ribs, spicy sausage pizza or grilled hanger steaks.